At long last, the era of dolphins biting unsuspecting children at SeaWorld may have come to an end. The company's Orlando park announced that it would no longer be allowing visitors to hand-feed fish to dolphins - an opportunity that used to cost a mere $7. But the dolphins - and children - aren't safe just yet. The company will still be offering $15 packages that allow guests to touch them under the supervision of a trainer. 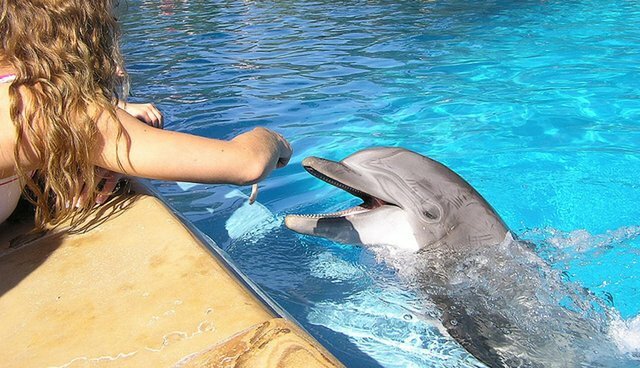 SeaWorld spokesperson Becca Bides told The Orlando Sentinel that the revamped petting program is similar to those at the company's parks in San Diego and San Antonio, where feedings have always been guided by trainers. Close interactions with dolphins put visitors at risk, but that's just one problem with dolphin captivity. According to the organization Whale and Dolphin Conservation, parks that keep dolphins in tanks are preventing them from expressing normal behaviors, and captivity can induce abnormal behaviors, sickness and early death.